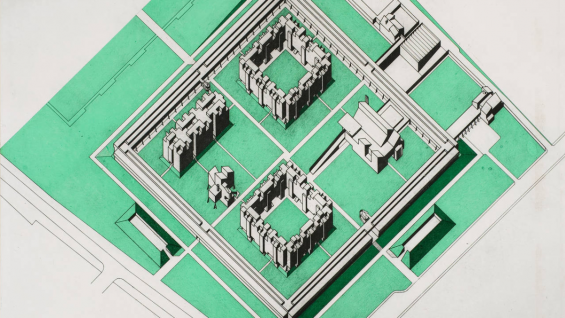 Dean Anthony Vidler Curates "Notes from the Archive: James Frazer Stirling"
The exhibiton Notes from the Archive: James Frazer Stirling, curated by Dean Anthony Vidler, will be on view from 16 May to 14 October 2012 at the Canadian Centre for Architecture, Montreal. "Architect James Frazer Stirling’s work has resisted characterisation because of its radical shifts in influence, named by others as prewar modernism to Neoclassicism, Rationalism and Brutalism to Postmodernism. But the continuity of his thinking emerges through the stupefying quantity and variety of material in the James Stirling/Michael Wilford Archive, a tool for understanding an architectural practice of unusual complexity. ... A part of this exhibition has travelled to Yale, the Tate in London, and the Staatsgalerie in Stuttgart since 2010. At home in Montreal, it is bigger and changed. Notes from the Archive is the most thorough examination to date of the practice of one of the 20th century’s most important architects, and on the possibilities of archival research." Dean Vidler also delivered the talk Vernissage: Notes from the Archive for the opening event.